"This amazing coffee table book by Candice Dyer weighs in at nearly 300 pages, and is chock full of beautiful photographs and articles on the many great artists who called Macon, Georgia home. From the street singers, like Rev. Pearly Brown,who would go on to perform at Carnegie Hall and the Grand Ole Opry, to the Godfather of Soul James Brown, the rock and roll legend Little Richard, the soul dynamo Otis Redding, and the fathers of Southern Rock, The Allman Brothers Band, they are all here. 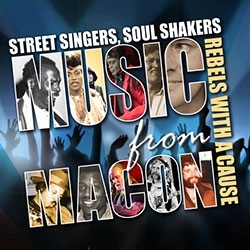 All of this, wrapped up in a simply beautiful cover and design, make Music from Macon an indispensable addition to anyone’s music history library." Street Singers, Soul Shakers, Rebels With A Cause author Candice Dyer writes features for Atlanta Magazine, and has contributed to Men's Journal, Paste, American Profile, Georgia Music Magazine and The Atlanta Journal-Constitution, among other publications. Pick up a copy at Travis Jean and Fresh Produce Records in downtown Macon or your local book retailer.